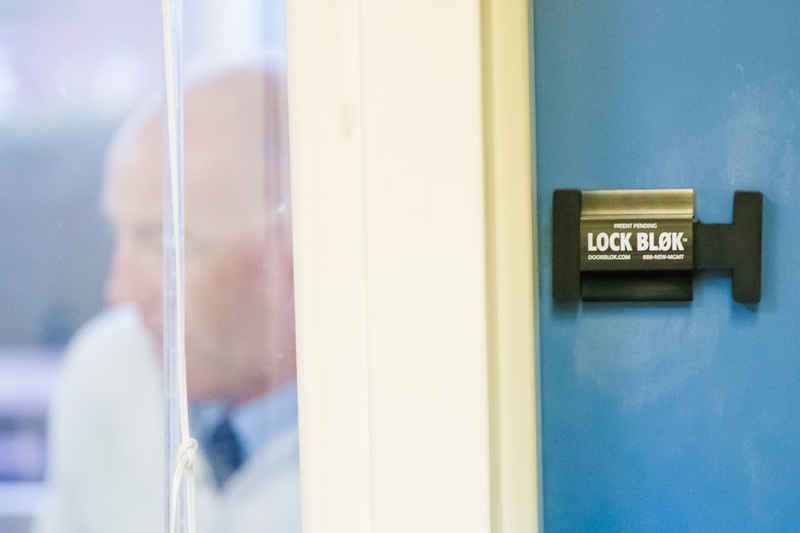 Three years ago, a former educator created the Lock Blok, a tool to lock classroom doors from the inside rather than traditionally locking them from the outside. SLO High Principal Leslie O’Connor pulls on door handles, looks through windows, and bangs on windows in his assigned area. Sometimes, he tells the class on the other side of the door to open it for him. If they willingly open the door, they fail. If he can see students through the window, it’s a fail. If the door is unlocked, fail. If an active shooter ever does come to campus and a classroom fails to implement any of the lockdown protocols, students and the teacher could be in danger. Lockdown drills are a common way for schools across the country to prepare for the worst. On the Central Coast, schools and law enforcement officials are working together to understand the changing reality of safety guidelines in the event of an active shooter. A new phone app and proactive thinking are some of the ways that these entities are working together to ensure student safety. 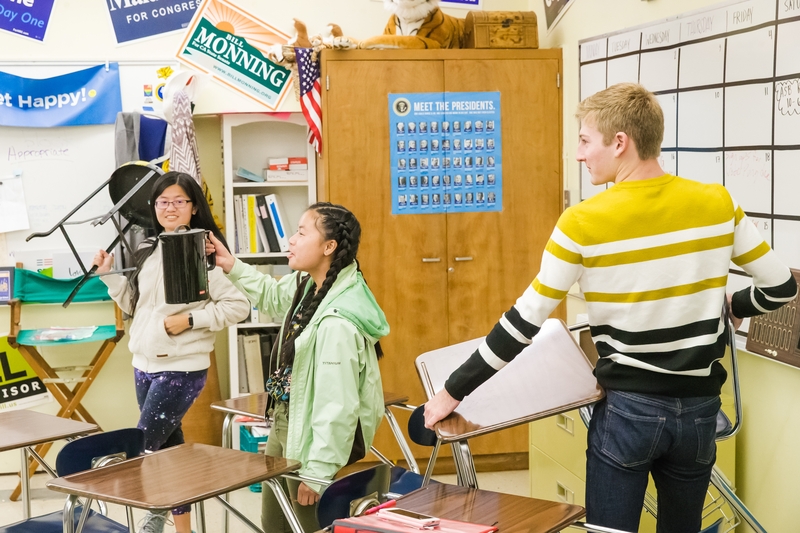 In the back of everyone’s mind, aside from “it could happen here,” is that news of such incidents has left a greater impression on their lives than any other type of school emergency they prepare for—namely earthquakes and fires. Brent Vander Weide started his career in education around the time of the Columbine High School massacre, something he’s never forgotten—but he didn’t know that it would affect his career the way it has. In the April 1999 massacre that occurred at Columbine High School in Columbine, Colorado, two 12th grade students opened fire and murdered 12 students and one teacher, injured 31 people, and took their own lives. Vander Weide is the student safety and support coordinator for the Lucia Mar Unified School District. This is the first year that he and the district rolled out ALICE Training, which the Santa Maria Joint Union High School and Lompoc Unified School districts also follow. ALICE stands for alert, lockdown, inform, counter, and evacuate. These instructor-led classes prepare and provide a plan for individuals and organizations about how to more proactively handle the threat of an aggressive intruder or active shooter event. Lockdown drills are taken very seriously at San Luis Obispo High, where designated staff check every classroom for locked doors, hidden students, and lights out. “If you hear gunshots, and you know that it’s far away and you have an opportunity to evacuate, ALICE is designed to give you that authority to make that move and get yourself to safety,” he said. Vander Weide said in the Sandy Hook Elementary School shooting in 2012, a boy decided to run, evacuating the situation, and about seven other kids followed him. That’s the whole point of ALICE, he said. The boy had the authority as a little kid to make the decision and saved other lives by just taking off. “While we don’t necessarily want to train and drill those younger kids, we want our kids, especially the middle school and high school, to understand that here are your options. You have the authority to exercise your options and survive,” he said. Vander Weide said that he’s able to provide those people with recommendations on the best decisions, but he’s not able to give direct orders. The district changed the name of its emergency drill procedure from “lockdown” to “secure in place,” which aligns with the more proactive approach that ALICE teaches. He said if you’re going to run, be a moving target—moving targets are harder to hit—and offer distractions. Brian Zimmerman, director of Pupil Services at Santa Maria-Bonita School District, said while some district personnel have gone through the ALICE training, the district is really letting the Santa Maria Police Department take the lead on how it should be preparing. The district is moving away from the more traditional duck-and-cover lockdown drills, he said, because they aren’t the best way to keep students safe. Santa Maria-Bonita is meeting with the police department and the high school district as it decides the next steps to better prepare its teachers and students for an emergency such as an active shooter, Zimmerman said. Each school site has a safety plan, but the best practices for safety are constantly evolving, he said, and districts have to adapt. SLO High Principal O’Connor has been in the education field for 27 years as a coach, teacher, assistant principal, and principal—all at the high school level. Throughout his career, he said, the possibility of an active shooter coming to campus has been in the back of his mind—even though he feels safe at SLO High. “Columbine was in 1999, and the reason why I reference that is because for anyone that has come into the profession right around that time period, when you’re talking about active shooter, that’s all they’ve ever known,” he said. Since Columbine, there have been 10 school shootings that claimed more than five lives each—some had more than 30 casualties. There are countless other reported incidents where active shooters on school campuses injured fewer than five people. Jim Johnson’s AP government and politics students were asked what they would use if they had to protect themselves against an active shooter. Before, he said, schools really prioritized fire and earthquake drills. Now, there’s a huge emphasis on lockdown drills, conversations about what to do in the event of an active shooter on campus, and knowing who’s on campus at all times. Part of knowing his students are safe, O’Connor said, is by getting to know each and every one of them—literally. According to the California Governor’s Office of Emergency Services (Cal OES), active shooter situations are unpredictable and evolve quickly. First responders are needed to stop the shooting and mitigate danger, but active shooter situations are usually over within 10 to 15 minutes—before law enforcement arrives on the scene. Response time to an active shooter on a school campus is something the San Luis Obispo County Sheriff’s Office is hoping to improve with the push of a button. SLO County Sheriff Ian Parkinson told the Sun that the county is one of the first on the West Coast to have the safety tool in their holsters. With the help of Department of Homeland Security grants, his office purchased 3,200 app licenses, enough for almost every public and charter school in the county. The app has five buttons to choose from in the event of an emergency: active shooter (red), medical (blue cross symbol), fire (flame symbol), 911 (in green blocks), and police (a yellow badge symbol). Districtwide, employees have access to a specific passcode and login in order to download that app and utilize its services. The app is tailored to each school throughout the county as each campus has its own unique layout. The Sheriff’s Office contracted with Cal Fire to create a database with geomaps of every school. The maps identify every square inch of each school and highlight access points for local law enforcement. “If [law enforcement] is getting told it’s happening in the cafeteria, they can look right on the map and see exactly where it is. We can then direct personnel in because we want them to get close, but we don’t want them to be right up to it,” Parkinson said. “Between the mapping and the panic button, those were two areas that we felt that we could respond to a situation as quickly as possible and provide safety to students as fast as possible,” Parkinson said. Geomapping of the school and the phone app are the most recent steps in a comprehensive plan of student safety that the Sheriff’s Office has been working on for three years. The initial steps provided the tools to train law enforcement throughout the county and created a relationship with schools to assist them in their safety procedures. 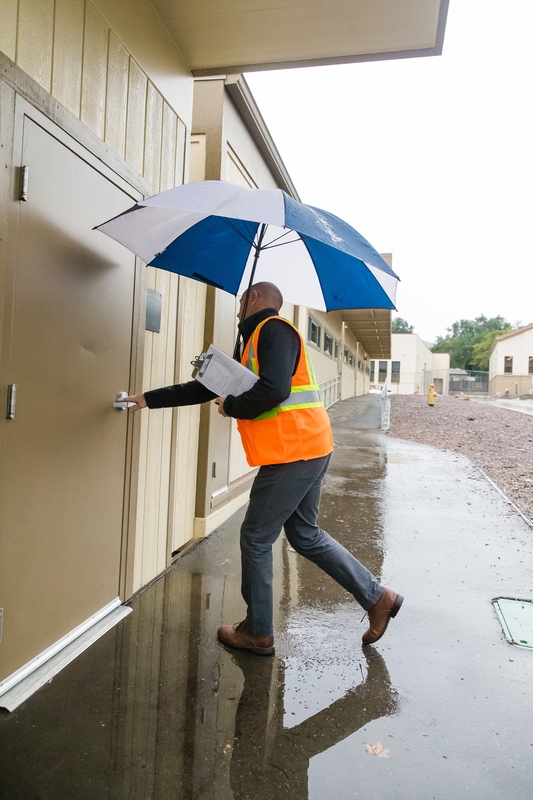 Knocking on the door, pulling on the handle, and asking for someone to open the door are just a few tactics that SLO High Principal Leslie O’Connor uses to check if classrooms are following lockdown procedures. Dennis Thomas is a senior deputy with the Santa Barbara County Sheriff’s Office, and he’s worked as a school resource deputy at two high schools in the Lompoc Unified School District for about a year. Schools in Santa Barbara County update their safety plans on an annual basis, Thomas said, and those that lie in the county’s jurisdiction send their plans to the Sheriff’s Office for review. Thomas said he’s charged with assessing and improving the plans developed by the schools he’s assigned to: Cabrillo and Maple high schools. Once that process is complete, Thomas said it’s largely up to him to train and prepare students, faculty, and staff for active shooter situations. He helps conduct safety drills once or twice every semester—sometimes ones that not even teachers have prior knowledge of—and he said the employees on both his campuses are well versed on ways to handle a shooting. “We talk about it, we read about it, but what we don’t do as much as we should is put scenarios together and practice,” Thomas said, adding that once the school year starts, it can be difficult for teachers to find any additional time to really sufficiently train for these situations. Teachers already have the responsibility of cultivating the minds of our future generations, he said, and now they have to think about saving lives, too. “They’re in a horrible spot,” Thomas said. As important as safety drills are, Thomas said they wouldn’t be necessary if school shootings could be prevented. That, of course, is an almost impossible goal, but it’s where Thomas puts much of his focus. If students are struggling in or outside of school, Thomas said he’s there to talk them through it. If parents, teachers, or even other students have concerns about a student’s behavior, he’s always available to address the situation, whether it be through connecting the student to appropriate resources and services, getting parents involved, or taking legal recourse. October 2015 Umpqua Community College, Roseburg, Oregon: A 26-year-old student killed eight students and one teacher, and injured nine others. May 2018 Santa Fe High School, Santa Fe, Texas: A 17-year-old killed 10 people and injured 13 others. Thomas said he’s often called on to investigate worrisome posts on social media. At Cabrillo and Maple high schools within the past year, Thomas said he looked into “a handful” of potential violent threats against the schools, none of which turned out to be credible. Most were misunderstandings, some were poor choices, but Thomas said all required some level of serious attention. “So monitoring, communicating, and listening are probably the best deterrents,” Thomas said. That, however, is easier said than done. Thomas has worked in law enforcement for nearly two decades, and he knows as well as anyone that teenagers don’t always get along with cops. In an effort to build trust with the students on his campuses, he’s coaching a high school baseball team, and he helps kids with projects in the schools’ auto shops. He hopes kids will eventually learn to see him as a coach, mentor, and role model, not just as the bad guy writing citations. Then in turn, kids will feel comfortable going to him with their problems and concerns, and that could lead to safer schools. After the lockdown drill is over at SLO High School, students resume their normal classwork. Jim Johnson’s AP government and politics class goes right back into the discussion they were having before the drill. The class is adorned with campaign posters from the most recent presidential election and the years prior. There’s also a poster with all the political parties on it. Students have put stickers on it to show where their allegiance lies. Johnson has created a space for his students to feel comfortable voicing their opinions. Johnson asks his class if they found themselves in an emergency situation and had to exercise self-defense, what would they do? He asks his class to look around the room and grab something they would use to arm themselves with. It takes the students less than a minute to grab something. A Hydro Flask, an umbrella, a chair, an entire desk, a knife. The knife isn’t a normal object in the classroom. Johnson is also an Associated Student Body advisor so it was one of the kitchen appliances in the classroom left over from a recent event. But Lili Steel says it’s almost normal to think about. New Times Staff Writer Karen Garcia can be reached at kgarcia@newtimesslo.com. 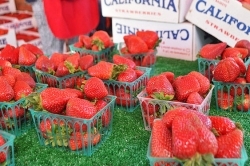 Sun Staff Writer Kasey Bubnash contributed to this story.